The Cypriot builders of the Karnic 1851 (descriptive of its imperial hull length) call this the Open version of the hull. A near literal name for what is known here as a centre console. 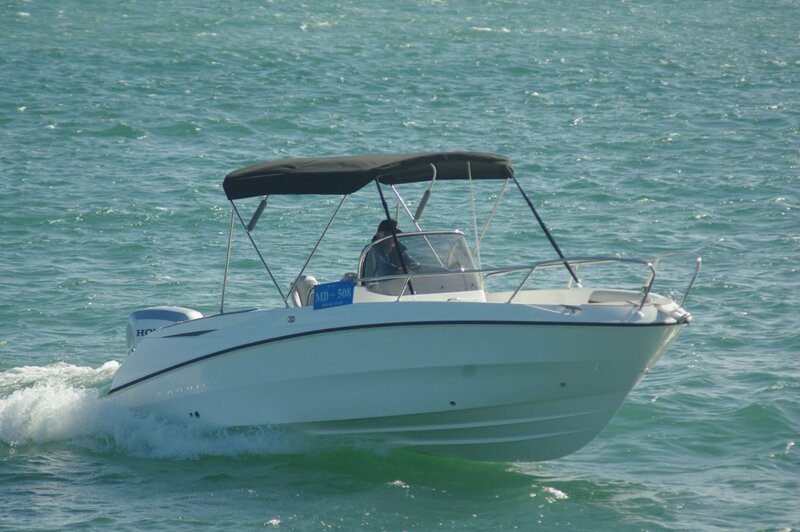 An adaptable boat, it is rapidly convertible from a family day cruiser to a purposeful fishing boat. Official capacity is six people and they have a choice of where to dispose themselves, including a sun lounge filling the space ahead of the console. Removal of some boards and redisposition of cushions converts this into a U-shaped lounge forward and a seat ahead of the console. The gap can be filled by a drop-in table. At the transom, a lounge offers alternative seating; the pod-mounted motor makes no intrusion into the space. Children, inevitably, will demand to sit forward. To cater for this, as well as for standing anglers, high-mounted rails run forward from alongside the console. 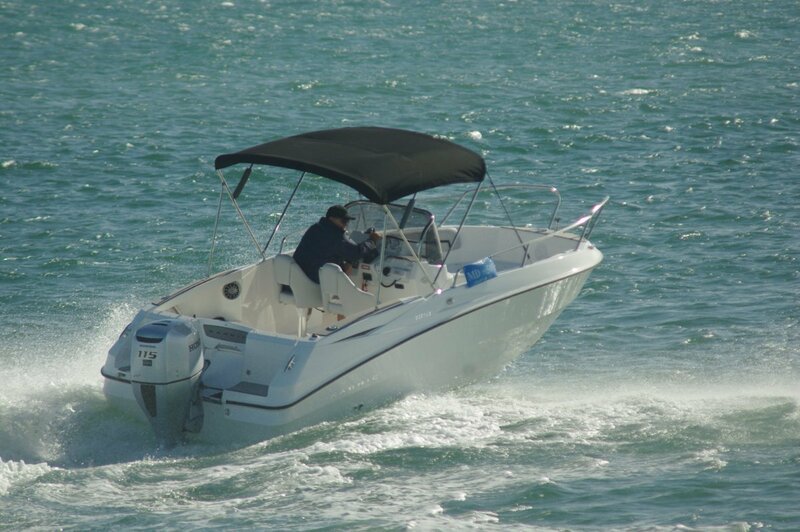 Cushions can be removed from everywhere by unpopping press studs, stripping the boat down for fishing action with useful amounts of open space. Unusually for a fibreglass boat of this size, the deck and lockers are self draining. To cope with the necessarily raised deck, the sides are built high to put coaming against angler’s thigh rather than knee. Tidy styling makes the height less apparent. Safe and comfortable standing would be academic if a couple of people standing there caused an excessive list. In the Karnic’s case three people – a bit above average in weight - standing there caused a less than alarming list; a good result. 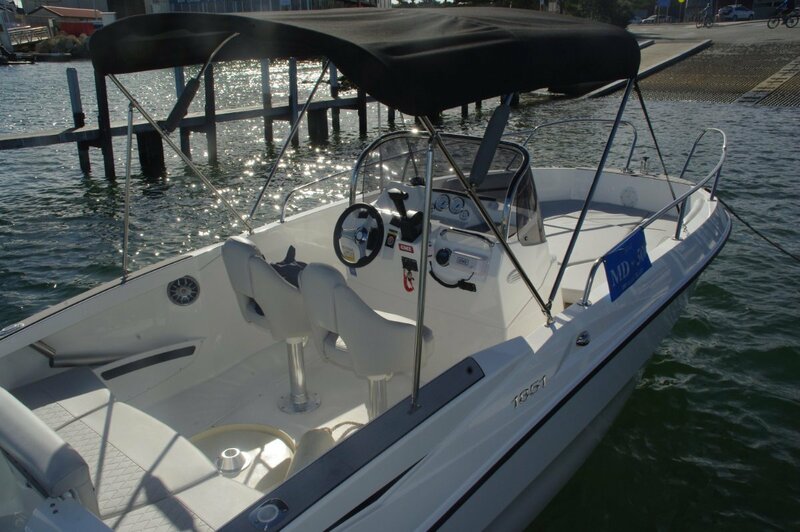 The review boat was fitted with a 115hp Honda – four-stroke of course – the maximum recommended. It was easy to see why: response to throttle was instant and vigorous giving acceleration up to a maximum of 37 knots. This was in the lumps of a developed sea breeze, so more could be available in flatter water. The hull coped well with that sea. 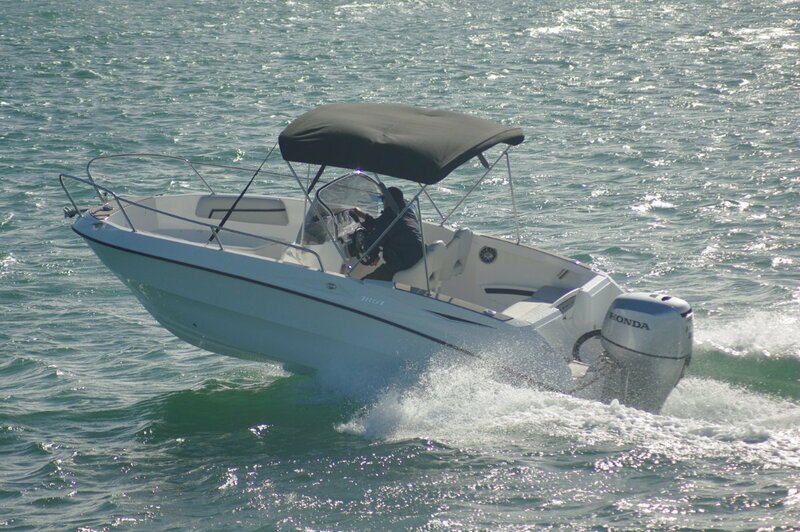 There is not a lot that hull shape can do to lessen the frequency of up and downing, but much that it can do to reduce the discomfort of the downing. Helped by appropriate amounts of motor trim, the Karnic’s hull absorbed very well what the sea had to offer. It did it quietly as well; certainly quieter than an aluminium hull, although not everything was due to the material itself: this hull has particularly rigid construction. Centre consoles in this size range are generally light-on for stowage, which would be missed in the cruising role. It is not a problem here. There are partial side pockets for oddments, and caverns under the forward seating and within the console for the big stuff. The console especially swallows in bulk; the front hinges open to reveal a space that goes right down to the keel. A pair of excellent pedestal mounted swivel seats faces the dash. These work well sitting or standing; for the latter hand holds are provided in a uniquely Karnic way. The windscreen is notched at its lower corners, allowing the stainless rim bracing the screen to accept hands as well. The driver has the port hand seat, European style. Ahead of him or her is a logically laid out dash with analogue engine gauges, switches and space for a combo screen. The radio is mounted ahead of the navigator, as of course, are the controls for the stereo. The occupants of these seats, plus those standing behind, get the full benefit of the simple canopy. This can be furled in seconds to give clearance for rods. Among the thoughtful touches is a neat anchoring set up. There is the usual short bowsprit to mount the anchor but, instead of the common securing system, the chain is held down by a screw jack – big ship style. Continuing the analogy, the cable leads into the locker via a pipe opening, among other things absorbing the wear of the chain.